← Guest Post: ‘Conversion’ by Colm Dore. There’s a pink balloon blowing along beside the path in the Ormeau Park, left over from some charity event. 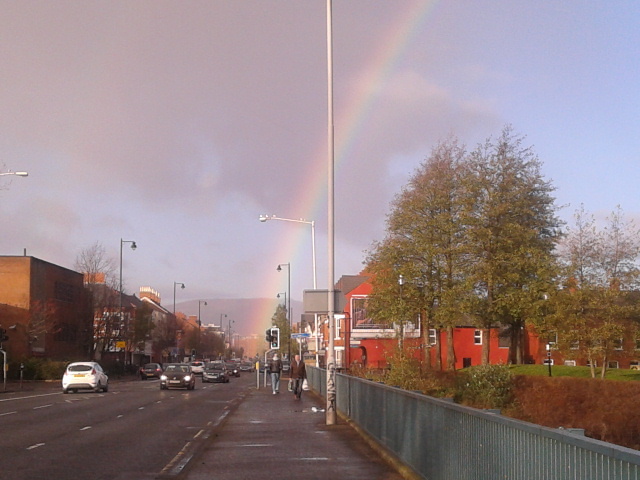 The wee girl is delighted to find it, and lifting it runs along through the tall gates and onto the broad pavement of the Ormeau Road. Later, you will play ‘don’t let it touch the ground,’ using tactics like whacking it hard and fast to surprise her, or letting it drop gently to make her rush for it. You will bounce it off your head, knee, backside, and nearly letting it land on the carpet, kick it in slow motion; anything to get her squealing with laughter and excitement. Balloons are great. She runs along, five yards ahead of you, waving the balloon around with pure 5-year-old joy. Then it catches her leg. She loses her grip and a gust of wind playfully takes it out of her hand and into the nearside lane of the Ormeau. This is the point, far enough from the traffic lights at the bridge, where the cars go up a gear and accelerate past the speed limit. And here it is, that never-going-to-happen-to-me moment; it smashes through the veil of spring serenity like an out-of-control cement lorry. You are too far away to reach her in time. She pauses for a split second, instinctively knowing that the road is dangerous, but when the wind takes the balloon again she panics and without looking runs into the road, oblivious to your shouts. As you run, with heightened senses you notice: a taxi driver parked on the other side of the road, his face creased in horror, the reflection of the scudding clouds in the shop window, the traffic starting to move from the lights at the bridge. A few strides and you’re there. You scoop her up into your arms, stand her up by the bus shelter and give her a good talking to: Never, ever, do that again. Ever. She looks down, crestfallen; sorry daddy, I won’t do it again, I promise. You are still trembling, but you’re lucky, and you know it; the Ormeau is a very busy road. It wasn’t today; there will be no drips and beeping machines, no recriminating phone calls, no small coffin. The what ifs? are there though, crowding out other thoughts on this fine spring day. Breathe. This entry was posted in Uncategorized and tagged Belfast, breaking the speed limit, child, Jason O'Rourke, luck, Ormeau Bridge, Ormeau Park, Ormeau Road, panic, road accident, short story, taxi, Vernacularisms. Bookmark the permalink.